It is my experience that resource pools are nearly a four letter word in the virtualization world. Typically I see a look of fear or confusion when I bring up the topic. Even with some other great resources out there that discuss this topic, a lack of education remains on how resource pools work, and what they do. In this post, I’ll give you my spin on some of the ideals behind a resource pool, show off a fancy infographic, and then discuss ways to properly balance resource pools by hand and with the help of PowerShell. … for when a workload needs a dedicated amount of resources at all times. Now, this isn’t to say that a resource pool is the only way to accomplish these things – you can use per VM shares and reservations. But, these values sometimes reset when a VM vMotions to another host, and frankly it’s a bit of an administrative nightmare to manage resource settings on the VMs individually. I’ll give an exception to those using some sort of script, but it would require adding some creative solutions to identifying which VMs should be set to what resource values (folders, annotations, etc.). I personally like resource pools and use them often in a mixed workload environment. If you don’t have the luxury of a dedicated management cluster, resource pools are an easy way to dedicate resources to your vCenter, VUM, DB, and other “virtual infrastructure management” (VIM) VMs. People fear resource pools because they are mysterious like a wild unicorn. Ok, maybe not that mysterious, but they are a bit wonky at first. Also, they are easy to misunderstand, and thus misuse. Here is an infographic I’ve created that shows a typical scenario where someone has deployed a resource pool without understanding fully how they work. Look through the graphic and then we’ll discuss further. Have you had a chance to look at the picture? Hopefully yes, so let’s cover it. Where Did I Get Those Numbers? Based on this math, the Production resource pool has roughly 80% of the shares. However, when you divide those shares for the resource pool by the number of VMs that live in the resource pool, you start to see the problem. The bottom part of the infographic shows the entitlements at a Per VM level. Dev/Test has more than twice what Production has when looking at individual VMs. Much easier, right? Realistically, I could have just chosen a per VM share value of 2 for Production and 1 for Dev/Test. They would both do the same thing. Note! If the number of VMs in the resource pool change, you’ll need to update the resource pool shares value to reflect the added VMs. Your options are to manually update the pool when the number of VMs inside change (no fun) or use … PowerCLI! Now that I’ve invoked the PowerCLI SpongeBob graphic (Wooo!) let’s do some coding. This very basic script will connect to the vCenter server and cluster specified and look at the resource pools within. It then reports on the number of VMs contained within and offers to adjust the shares value based on an input you provide. It confirms before making any changes (just click or answer No if you don’t want the change). 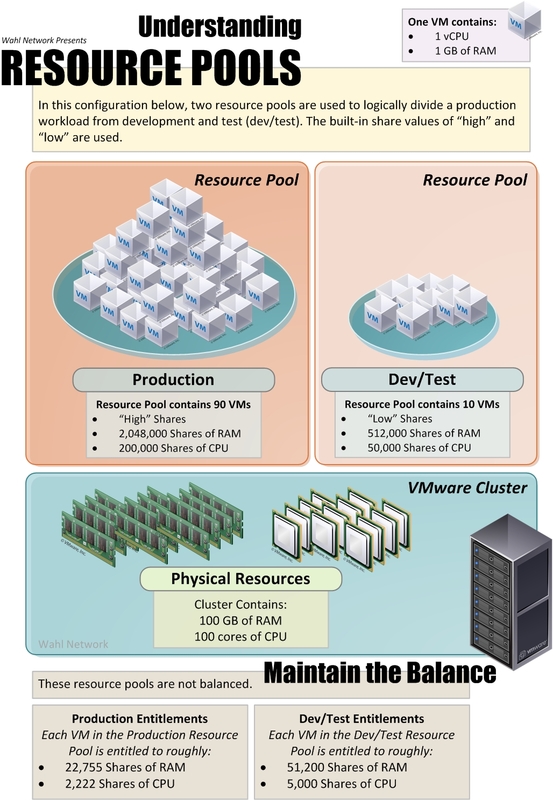 [int]$pervmshares = Read-Host "How many shares per VM in the $($rpool.Name) resource pool?" Write-Host "Found $totalvms in the $($rpool.name) resource pool. At $pervmshares each, this pool should be set to $rpshares shares." Make sure to change line 02 and 03 to specify your vCenter and cluster name. Feel free to distribute and modify at your leisure, I take no responsibility if your environment catches fire, becomes sentient, etc. I hope this has helped clear some confusion around resource pools, although it’s a big chunk to swallow in one bite, and I’m sure there are a lot of other competing opinions floating out there that won’t jive with mine. I’m OK with that. One thing I would like changed is the ability to set per VM shares on the resource pool, and let the pool automatically adjust for membership values. I’ve actually spoke with the engineers about this problem multiple times. We are looking to solve this in a future version. I can’t make any promises or commit to dates, but I assure you that this is being looked at right now. Thanks for the heads up Duncan, that’s great news. I’ve encountered a number of environments that use resource pools, although none of them were at a point where the contention hit a point where shares were “active”, but all were configured as I show in the graphic. I decided to give my own spin on correcting the issue in this post. I’ll add pingbacks to those articles. Carrying the torch into 2012! My favorite is the other very common problem of folks using resource pools simply as folders for VMs. I remember one environment that literally had 100+ resource pools, often with just one or two VMs in each, just because they wanted to logically separate them. That’s when you start getting into serious trouble. It’s the silly cartoons and graphics that keep me coming back. Nice work Chris. I hear you on the “resource pools as a folder” issue. The post got so long that I didn’t want to wander off into the weeds, but that’s another great gotcha. Making silly graphics are actually the real reason I blog, the technical stuff is all a ruse! The production/test resource pools exist in quite a few places, and you’re right, it’s a management nightmare! Glad to hear Duncan say that they are at the very least aware and we may see a solution someday. Production/Test is a great way to utilize resource pools but not at the expense of always recalculating shares every single time a VM is powered on or off! Great Post, Great Graphics! Great job!!!! Thanks from Brazil. Chris, thanks for the great article. Here are my thoughts. Handing out parts of absolute capacities like reserved memory in a pool hierarchy makes sense as it is additive. As you pass down the resource pool tree you get given a piece of ‘cake’ and you cut it up and hand it down. Handing out proportions doesn’t make sense as it ends up being multiplicative as you go down the tree and it’s hard to know what you have been handed. The issue relates to VMWare’s fundamental goals ‘isolation between pools’ and ‘sharing within pool’. A better approach would seem to be to make shares ‘flat’ (independent of where they are in the pool hierarchy) and only apply to VMs. Then you could monitor the results at each level in the pool hierarchy and set limits & notifications. So for your example, you have 100 VMS, 90 with high(4) and 10 with low(1), so we have a total of 90*4 + 10*1 = 370 shares. Each high VM gets 4/370 resources and each low VM gets 1/370 resources. Production gets 90*4/370 (97%) resources and DEV/Test VM gets 10*1/370 (3%) resources and if we power on or off or move VMs, then this ratio changes to reflect that. Agreed. I’ve been advocating for Per-VM shares for a long time now, still no dice. The pool idea works well for vCloud, though. Great article. I just have a comment on the script; what about if I have vApps inside the resource pools?, when I run the script it doesn’t count any VMs inside a vApp so the share calculation is not entirely accurate. Any ideas? thanks. Thanks for the article. I think I understand the concept but I hope I can get a little more clarification on one thing. In your example you stated each VM had 1 CPU and 1 GB of RAM. If I had a VM with 4 CPU’s would it need 4x as many shares as a 1 CPU VM? I assume the answer to that question would also apply to a VM that had 4GB of RAM as opposed to a VM that had 1 GB of RAM. Correct, although if you keep all of the VMs inside the resource pool at the default “normal” shares this will happen automatically (see the “Where Did I Get Those Numbers?” section to see how VMware does the math, tweak as needed). I’m mainly focused on the resource pool shares as they relate to other resource pools. Hi Chris, sorry for exhuming this post. Can you clarify something on this please? I’m assuming if you have multiple VMs of differing vCPU/Memory configurations you should allocate shares to the parent Resource Pool based on total vCPU/Memory of child machines, and from there it would divvy out the resource automatically based on those resources? i.e. 2 VMs in a RP, one with 2 vCPUs and one with 1vCPU. The 2 vCPU VM would get 66% and the 1vCPU VM would get 33%? As far as i can tell the script simply goes on the VM count, which could cause an imbalance if VMs are sized differently? I have one question, when we put 20 VMs in resource pool e.g “Prod” and if those VM’s vary in CPU & Memory e.g. 5 VMs are 1 GB,1 vCPU and 15 VMs are 16 GB and 8 vCPU even there will be significant difference in resource allocation within the resource pool i.e. in Prod resource pool. In my case I have number of VM’s where VM’s % share is Zero. It means when contention occurs then these VMs in Prod resource pool won’t get any resources. Is it correct? And this is the reason you recommend using VM level shares? You can tweak the values based on the total number of vCPUs and vRAM used if you have a lot of variation on your VM configuration. Ultimately it doesn’t matter much, as the important part is how much you assign per VM to production opposed to non-production to ensure priority to the higher tier. Within the pool, each VM can use the standard “normal” share value to request what it needs based on its configured vCPU and vRAM size. Sometimes the vSphere Client will report “0%” shares, but it also rounds to the nearest number. If you have hundreds of VMs, the % per VM becomes very tiny indeed. Thanks for the article Chris. I teach the ICM course and really appreciate explanations such as these, especially the bit about doing the math backward … I expect fewer blank looks from students in my current batch when I delve into resources pools and the Pie Paradox. A big thanks for this blog. I have one question for you please. Great explanation! Here is another good article, if you want yet another point of view. Great article – rare gem indeed. Why are the share values for CPU and RAM different by an order of magnitude? if it’s just really about the ratio – even counting from desired entitlements per unit VM – why couldn’t i just put multilply 4:2:1 by the respective VM count for both? I saw this wasn’t answered, but are turned off VM’s counted as well? That’d be a good question for the developers. I don’t know why they chose those values. The ratio of the value is all that matters – it is an arbitrary number. Shares are used when contention occurs. This only affects Powered On VMs. Just an update, actually talked to a rep and their explanation for the share values was because of granularity, while still arbitrary, the more shares in the pot the more precisely you can divvy out the resources. .. on the other hand i was watching this https://www.youtube.com/watch?v=6qg7pVNuAnU by the guys that designed resource pools and around the 29:00 mark, he explains that the number of VM’s shouldn’t matter because shares are only applied during the contention. In theory, you should never have ALL of your VM’s reach 100% and need contention resolution… but that’s theory.. have you experienced this/ seen this vid? Thank you for the quick response. i think they need to rewrite their explanations in the guide. my best guess is they wanted both the share values for memory and vCPU to be in the 100,000 range. Instead of us working backwards, why don’t they change the vSphere Client (and the Web Client) to allow us to enter the PER VM share values and the system calculates the total number of shares required for that Resource Pool. It would make much more sense. 96 * [2800 shares] = 268800 shares for cpu and ram on the production resource pool. Now if I was to add two child resource pools named webservers and applications, and I’d like in times of contention that WebServers are favored – how would one set this up? Even if quite old, this is the best post i have found about resource pools. Thanks, Marco. I’m not aware of any material changes to Resource Pools having landed in vSphere 6.0. I have 16 ESXI with 96 GB of ram each. That means I have 1536(16*96) GB of ram in total in my environment. I have vmware vshpere enterprise plus license. I have implemented DRS in my environment. One of my customer is asking for one VM with 120 of RAM and he is doing animation rendering jobs. And that 120 of RAM will be consumed totally when the vm is working. If I use resource pool then Can I allocated more RAM than I have 96 GB for single ESXi. As far my understanding I cannot create a VM with 120 GB of RAM which will consume the whole 120 GB of RAM during rendering task by my customer. Because if I cerate a vm with 120 GB of RAM and this VM will reside in one of the hosts in DRS cluster. Please help me whether i am wrong or right. It wouldn’t be a great idea to create a VM with more vRAM assigned than what a single host can provide. It’s certainly possible, but conflicts will be resolved by swapping the RAM to disk (or some other device). We are considering using NETIOC vm network resource pools in our environment and I was wondering if the constraints you are describing apply also to vm Network resource pools. I’m going to preface my comment with something to avoid such answers as “Resource Pools are not folders”: I understand what resource pools are and their intended function, I’m looking for a more technical explanation to be able to convince more powerful people than I at my workplace so I’m hoping you can help as my searches have not provided very detailed information anywhere. If EVERY resource pool in the cluster has the “Expandable Reservation” and “Unlimited” check boxes checked, why is it bad to use Resource Pools for organization and permissions? It’s really about the shares and how they are poorly calculated, static, and non-obvious, especially as child and sibling pools are created. There’s also some complexity added when the cluster is looking at providing services, such as DRS, with the scheduler having to look at “pointless” resource pools before deciding how to best serve the workloads. If you need to provide isolation for tenants or specific workload groups, you’re using resource pools as intended. If it’s just for logical grouping and “making the dashboard pretty,” folders and tags offer a much better experience. So, for example, all RPs with “Normal” shares will have always 4000 CPU shares and 163840 Memory shares, no matter how many VMS the RP has. Latter, as far as I understood, each VM can have a different “Hight/Normal/Low/Custom” shares that are calculated with the 1:2:4 way that you explained, but only applied (I guess) inside the RP itself, and to get the shares that the RP has been granted (what are fixed). Everybody links to this article to explain RP and shares, what make me really confuse. If you please can clarify this, I would appreciate. You create a Resource Pool with a ‘Normal’ setting. That means the pool has 4000 shares of CPU, the default value as you correctly noted. You now create/powerup 16 VMs with one vCPU each inside it. How many shares have been issued INSIDE the pool? That would be 16000 shares as each VM inside the pool gets a default CPU share value of 1000 per vCPU. If you shutdown 8 of those VMs, the number of shares issued changes to 8000. Remember, it is based on powered on VMs. Chris simply took that same concept and applied it the other way by using the VMware default share values for 1vCPU and 1GB vMem against the physical resources of the cluster. The cluster itself is the root resource pool. Take your two pools in the article above but instead of a Test pool with ten 1vCPU VMs I instead have nine 1vCPU VMs and one 8vCPU VM. How many shares does the 8vCPU VM gets out of the 500 assigned to the pool? Is it still unchanged at 50 shares per VM or do the 500 shares now get divided per the number of vCPUs, meaning 27.7 shares for the nine 1vCPU VMs and 222 shares for the 8vCPU VM? If the later, does that means I still have an imbalance problem where this 8vCPU Test VM will have more weight that a Production VM with 100 shares if there’s resource contention? wow . truly if you can not explain it easily you do not understand it . you explained it very easily and it says a lot about you as an expert in the field . thank you CHRIS. How to get the number 100 shares and 50 shares, can you explain me more details?